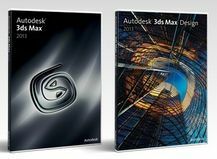 Autodesk® 3ds Max® and Autodesk® 3ds Max® Design software provide powerful, integrated 3D modelling, animation and rendering that enable artists and designers to focus more energy on creative, rather than technical challenges. The products share core technology, but offer specialised toolsets for game developers, visual effects artists and motion graphics artists along with other creative professionals working in the media design industry on the one hand; and architects, designers, engineers and visualisation specialists on the other. Autodesk 3ds Max provides a comprehensive, integrated 3D modelling, animation, rendering and compositing solution for game developers, visual effects artists and motion graphics artists along with other creative professionals working in the media design industry. Powerful 3D modelling—With an extensive polygon modelling and texture mapping toolset, you can create compelling characters, props and environments more quickly and effectively. Advanced character rigging and animation—The fully-integrated Character Animation Toolkit (CAT) provides an out-of-the-box advanced rigging and animation system. Accelerated rendering options—Create highly realistic or stylised looks at faster speeds with unlimited batch mental ray® rendering, interactive GPU hardware rendering with Quicksilver, and the NVIDIA® iray® renderer. Extensible pipeline support—Customise, extend and integrate 3ds Max into existing pipelines with support for C++ and .NET. Adobe software interoperability—If you’re a creative professional in the media design industry who uses Adobe® After Effects® or Adobe® Photoshop® software, you can enjoy a level of interoperability that sets a higher standard for 2D/3D data exchange.